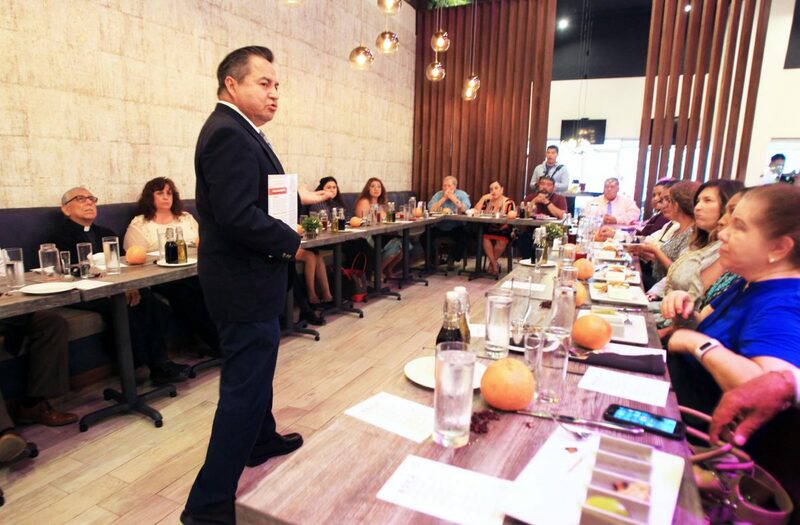 Salomon Torres, Unidos Contra La Diabetes program manager, talks about the three-course diabetic-friendly meal served during a luncheon at Boka 400 on Tuesday, April 24, 2018 in McAllen. 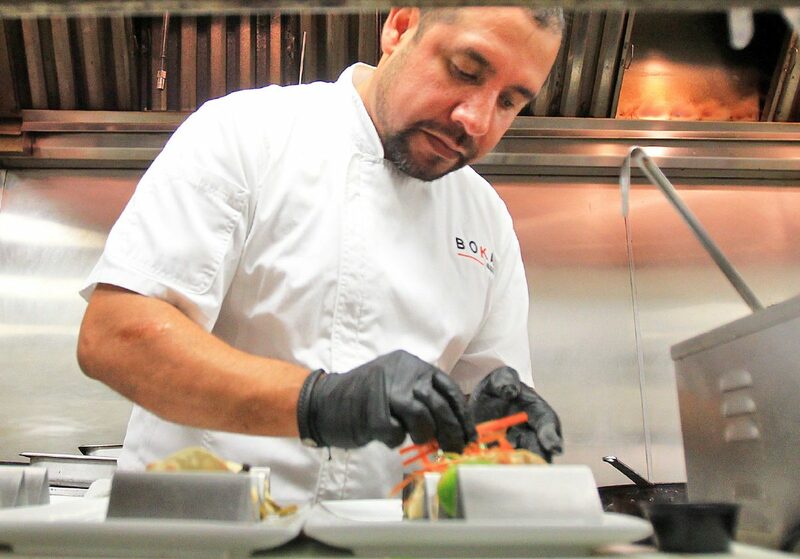 McALLEN — In crafting a three-course diabetes-friendly menu to be served during Plaza Amistad’s community leadership luncheon, Boka 400 Chef Sergio Esquivel and licensed dietician Laurie Garza scrutinized every ingredient. One in three adults in the Rio Grande Valley have pre-diabetes — a condition in which blood glucose levels are higher than normal, making them more likely to develop Type 2 diabetes. The event aimed to increase the success of diabetes management and healthy lifestyles by demonstrating how all can enjoy dishes with a low glycemic index. Attendees included representatives from Valley health centers such as Unidos Diabetes, Methodist Health Care Ministries and Healthy South Texas, as well as other local leaders from the county. Chef Sergio Esquivel creates a three-course diabetic-friendly meal at Boka 400 on Tuesday, April 24, 2018 in McAllen. Taco Portobello served during a diabetes friendly community luncheon at Boka 400 on Tuesday, April 24, 2018 in McAllen. With a menu that can be adapted to suit any form of dietary need — vegan, gluten-free, paleo, etc. — Plaza Amistad chose Boka 400 to host its diabetes awareness and prevention luncheon. Plaza Amistad, the outreach brand of the Catholic Diocese of Brownville, exists as an organization dedicated to solving community problems by incorporating wellness, sports, education and other projects, said Patti Sunday, the marketing director. While guests dined, Garza explained the macro- and micro-nutrients from the menu, which had been adapted from less health-conscious versions of the item. “The biggest thing with diabetics is controlling their blood sugar, choosing lower carb meals,” she said. 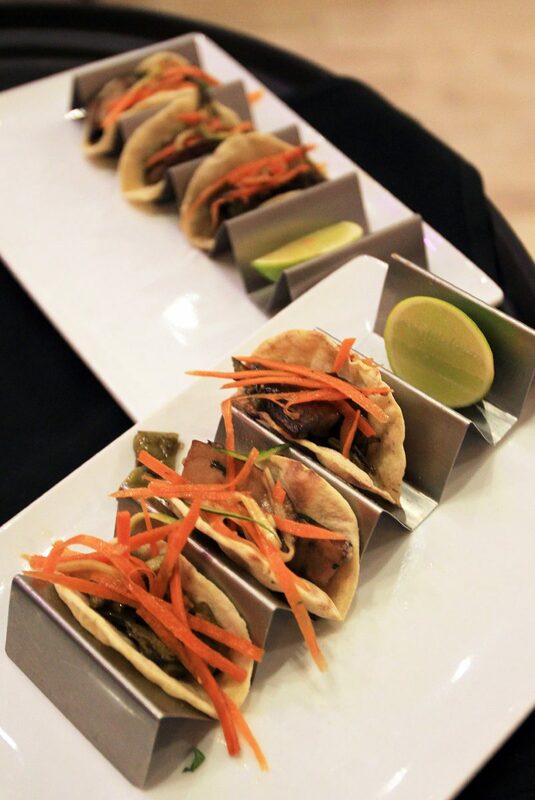 As a twist to the food ritual known as “Taco Tuesday,” portobello mushrooms were served in a naturally colored red or green gluten-free tortilla made of cauliflower and beets or nopales. Many agreed the tortilla tasted no different, or if anything more flavorful, than the traditional prepared from masa harina. Esquivel praised the abundance of local produce, as well as ranches, in the Rio Grande Valley — from heirloom tomatoes, to the “best” citrus — emphasizing how locally sourced ingredients provide “better flavor,” and in turn better quality. Norma Villanueva, clinical director of the Nueva Luz Foundation, shared how diabetes relates to mental health. Those suffering with depression, anxiety or post-traumatic stress disorder may have issues with fluctuating blood sugar levels, she explained. The speakers addressed the risk of today’s children having a shorter lifespan than the current generations due to poor diet and answered questions regarding the best method to prepare food in order to retain the most nutrients and addressed the “healthiness” of certain food items, like hot sauce. Feeling the spirit of friendship — amistad — a guest shared grapefruit from a tree in his home with all present. Another brought her gluten, dairy and refined-sugar free banana bread. Future plans for Plaza Amistad include planting a community garden as a way to incorporate a farm to table style of cooking, said Sunday, and developing a meals on wheels program for those in need. To find out more or to get involved, visit Plaza Amistad’s Facebook page.